Radiation that drives photosynthesis is called photosynthetically active radiation (PAR) and is typically defined as total radiation across a range of 400 to 700 nm. PAR is often expressed as photosynthetic photon flux density (PPFD): photon flux in units of micromoles per square meter per second (µmol m-2 s-1 , equal to microEinsteins per square meter per second) summed from 400 to 700 nm (total number of photons from 400 to 700 nm). While Einsteins and micromoles are equal (one Einstein = one mole of photons), the Einstein is not an SI unit, so expressing PPFD as µmol m-2 s-1 is preferred. Sensors that measure PPFD are often called quantum sensors due to the quantized nature of radiation. A quantum refers to the minimum quantity of radiation, one photon, involved in physical interactions (e.g., absorption by photosynthetic pigments). In other words, one photon is a single quantum of radiation. 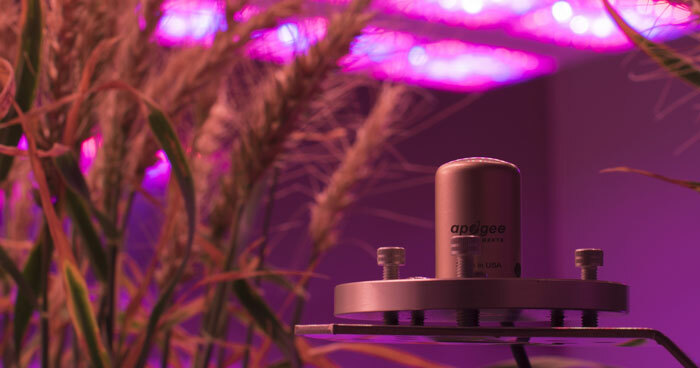 Apogee Instruments offers two types of quantum sensors, the Original Quantum Sensor and the Full-spectrum Quantum Sensor. The Original Quantum Sensor features an innovative blue lens to improve accuracy. The pigments in the lens filter incoming light for an improved spectral response. These sensors are a lower-cost option that are excellent for all light sources except for most LEDs where post-measurement correction factors need to be applied to achieve accurate readings. The Full-spectrum Quantum Sensors feature an improved detector that provides excellent measurements under all light sources, including LEDs, right out of the box. Sufficient lighting is vital for growing healthy coral. 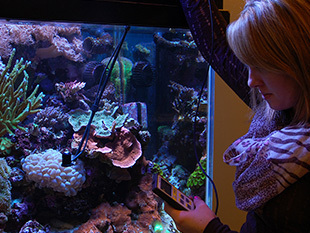 There are two critical components to adequate lighting for aquariums, intensity and spectra. Zooxanthellae is the algae that lives on the coral and through photosynthesis, provides glucose, glycerol, amino acids and oxygen for the coral. Light (or photons) in the wavelengths of 400 to 700 nanometers is responsible for photosynthesis and is referred to as Photosynthetically Active Radiation (PAR) or Photosynthetic Photon Flux Density (PPFD). This range is also referred to as Quantum. The Quantum Meter (model MQ-210 and MQ-510) manufactured by Apogee Instruments is ideally suited for use in aquariums. The sensor head is potted solid and completely sealed. There is no hollow cavity for water to eventually penetrate and cause measurement errors. The logging capability of the meter allows you to monitor light levels on a half hour basis for 99 measurements and stores a daily total for measurements made over three months. The appropriate light intensity for a coral reef tank is about 20 to 25 µmol m-2 s-1 for each gallon of water for aquariums 24" deep with a minimum of 10 µmol m-2 s-1 per gallon (Citation: Aquarium Lighting: Spectrum and Intensity by Drs Foster and Smith). For example, if you had a 25 gallon tank you would need approximately 500 µmol m-2 s-1.